Stabrooke Views. : Blackberry or iPhone? This is always the question in any cell phone driven conversation. And with the amount of attention paid to the iPhone by social media gurus, designers and the world of fashion, I'd have to agree with what my cousin has been preaching to me for the last year-- the iPhone is the phone of fashion. I won't lie, I am a avid bbm-er, and with my family and most of my friends living outside of Canada it is extraordinarily useful to me. But still i do intend on switching out sooner than later (sorry bbm! ), and I am extremely excited for that moment! So in honour of the iPhone5 (4GS??) dropping in the next 2 weeks, I've dug up some super cute accessories for them. This Michael Kors patent black and metallic gold leather wristlet retails for $84.95 ($79.95 US), which is actually alot less than I expected--is amazing! You can order it here from the apple site, Canadians! 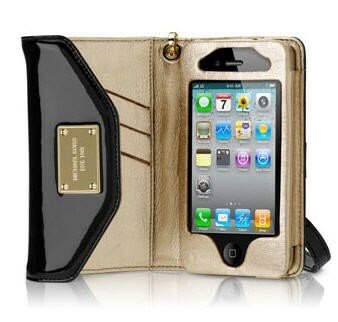 Instyle.com also has a really good slideshow of designer cases from the likes of Kate Spade to Marc Jacobs. Click here - to view the cases from instyle. 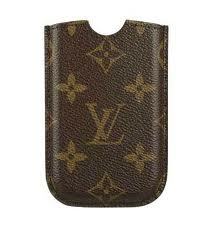 I did manage to find a leather, monogrammed Louis Vuitton blackberry case, which in itself is super luxe and at $290 is definitely a bit of a splurge.